One of the most difficult parts of living and working abroad, not to mention living in China, is getting your hard-earned rambos back home to pay bills, loans, mortgages, whatever. And to be completely honest, my wife and I have literally tried every method out there. In 2006, I was primarily doing the old bank wire transfer. Eighteen stamped pieces of paper, multiple forms of ID, and many wasted hours later, it might have been succesful. Most likely needed to return later that week. Back in ’09, I was almost solely using Moneygram. Western Union once. (I know.) After searching my city for months to find the exact bank, there was sadly a new teller every time who had never done it before. I got to explain the process including which paperwork to use every single time. And needed a friend on the other side to go “pick it up” and deposit in my bank. Around 2012, I mailed a secondary Unionpay debit card back home for my family to withdraw for me every month. I’m sure they pocketed a couple Benjamins. Since about 2014, though, I’ve just been throwing money away using PayPal. Because of convenience. A pain to set up, but a breeze to use. All online and near instantaneous. But some automated robot takes 3.5%  off the top. My wife’s even tried getting a Chinese friend to help send through Alipay. Talk about a headache of unknowns. Sound familiar? Geesh. Hope you’re not getting too overwhelmed… because we have good news! What is it? It’s a fully-guaranteed and user-verified peer to peer online currency exchange… the company itself never actually holds your money. How? They use Alipay or Wechat Pay and match you with someone else’s e-wallet who needs RMB. It could be a traveller or foreign student or even a local person working abroad. After you send your match the RMB, then they send the equivalent in that day’s USD exchange rate to either your PayPal or Zelle accounts as a personal transfer, so no ridiculous fees or taxes. Works going the other way, too! But that’s not our problem. So, once you get verified with your ID and add your payment QR codes, all you need to pay Swapsy for the transaction is 0.8% – 1.0% via SwapCredits. 100 SC is equal to $1. Much much cheaper than any previously mentioned method and no hassle whatsoever. And best of all, you don’t have to deal with a Chinese bank ever again! We first heard about this a couple months ago when we had a friend visiting from the United States. He was only here 3 weeks and felt like a second-class citizen not being able to use Wechat to its full potential. I ended up just sending him some hongbaos in exchange for his cash. It worked really simply and realized there’s probably a huge market for this type of “exchange” for people who don’t have friends living here. One Bing search later, and we had our answer. And thinking about it a minute more, we realized this was a genius way to move cash back to the US, too! Just $17 to transfer ¥12,000 to the USA! Huzzah! We’ve waited a couple months before telling you guys to make sure it’s legit. Again, this is a solid service and we’re purely recommending it because we use it ourselves and really think it’d be worthwhile for you, too. FYI If you sign up through this affiliate link, you’ll receive 500 SwapCredits absolutely free after you’re verified to use towards your first transfer. That equals moving about ¥3500-ish abroad for zero dollars! Yes, please. We know you’re still probably hesitant, but trust us when we say we’re not giving you this information lightly. If you’re continuing to question, start small and work your way up like we did. And remember, this is China, so who knows if or when this service will get shut down. Take advantage of it now! We understand this is a very country-specific service at the moment. But if you’re not from the US, this could still be beneficial to you as exchanging USD abroad is still much better than RMB. Glad you came across this service and it worked out well for you! 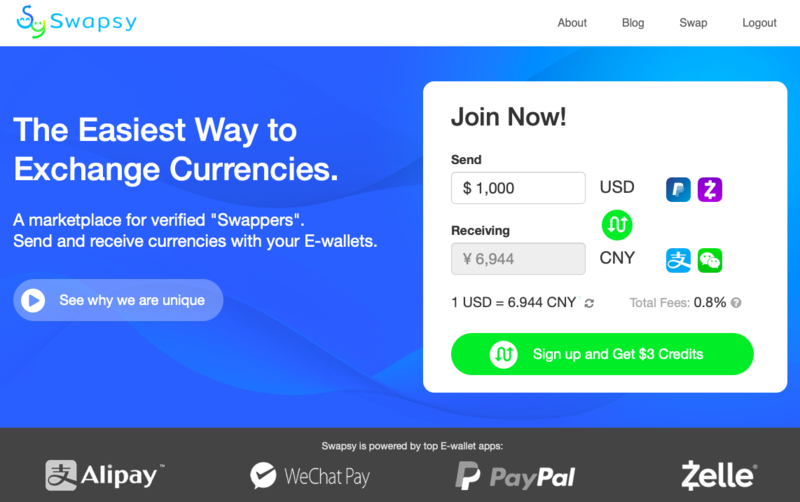 I’ve used Swapsy to exchange money in China in the past and as I’ve received feedback from others, I’ve come to see one big limitation: it only works after you’ve created a WeChat Wallet. Unfortunately, at this point, the act of sending money to somebody over WeChat won’t open the Wallet. You have to either have a Chinese ID or a Chinese bank account. All that to say, this service is great as long as you already have the WeChat Wallet feature. That makes a lot of sense for expats living in China, but maybe not for those travelers/short-term expats. 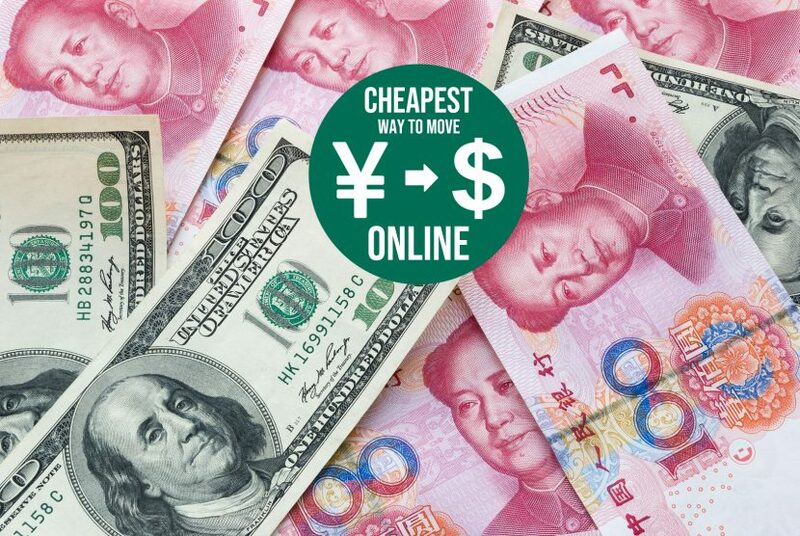 If you don’t have to pay a penny to transfer money across a boarder from China, that’ll be the cheapest. We have done a couple of ways. The first one is the old fasion way of carrying cash. If you make RMB legelly in China, your legal income can be easily exchanged to a foreign currency. What you need are a work permit, your Personal Income Tax Verification from the Chinese tax authority, and your employer’s statement. Then you can exchange all your income in RMB to a foregn currency. If you carry less than $10,000, you don’t have to declare at customs. When you deposit your cash over $10,000 in a US bank, you have to fill up a form. The second way is to use your bank card issued by a Chinese bank to withdraw cash on an ATM with the UnionPay logo. Some Chinese banks don’t charge any fees for oversea ATM withdraw but others may do. The downsides are : 1. there is a limit for cadh withdraw each day; 2. make sure the ATM operator doesn’t charge you any fees. Obviously, those are definitely the cheapest! But our article was about doing it online… thanks for your comment!